We are committed to protecting and defending the civil rights and liberties of all individuals facing prejudice and oppression, through direct advocacy campaigns and community-based education. Our chapter recently dispatched a letter to the United States Supreme Court opposing the proposed citizenship question for the future census. According to our letter: "Those of our members, who worked for the government to collect data for the 2010 Census in the San Fernando Valley, can tell you that most people are reluctant to share Census data, especially if they are immigrants, fearing that by bringing attention to them or family members might put them in jeopardy. The most persuasive arguments for participating in the Census were: 1) the data will not be used by other government departments, and 2) the primary reason it is important to be counted is for the State and County to receive federal funds for local programs proportionate to and according to the population. As a civil rights organization whose history bears witness and was founded on discriminatory treatment of immigrant and citizenship alike, we are offended and outraged that this kind of discriminatory data collection would be supported, let alone be encouraged by the U.S. Commerce Department. We see no rational value that would be served or justify a State purpose under the 5th Amendment or discriminatory purpose in violation of the Equal Protection Clause of the 14th Amendment." Click here to view the full letter and the response from the Supreme Court. Our chapter, acknowledging that the wartime trauma of internment and incarceration compels the JA community to stand with other oppressed people, has vigorously spoken out for the civil liberties of all those targeted by hatred and prejudice in the wake of September 11, 2001. The wartime hysteria that sent over 120,000 Japanese Americans to desolate concentration camps and stripped them of constitutional rights must never happen again to any community. Our board members have participated in various rallies and vigils, written op-eds, and have spoken at college campuses and in the community regarding solidarity with the Muslim, Arab and South Asian communities in LA and beyond. In addition to the JACL's traditional focus on issues of racial justice, our chapter is active in supporting the LGBT civil rights movement. In 1994 the National JACL became the first major civil rights organization to endorse marriage equality. This platform change was due, in part, to the work of our former chapter president Tak Yamamoto. Today, board members work closely with API-PFLAG (the Asian American branch of Parents and Friends of Lesbians and Gays) and other organizations to educate the public about and help bring visibility to LGBT Asian Americans. In 2011, the chapter co-sponsored a talk with Al and Jane Nakatani, two activists who spoke about how families must create positive, loving, and safe spaces for their queer children. 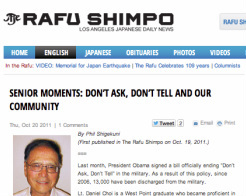 For coverage, click over to the Rafu Shimpo. We are also honored that one of our members is Marsha Aizumi, an educator and author of the timely book, Two Spirits, One Heart. This important work traces the relationship between Aizumi and her transgendered son. Aizumi recently received the "Japanese American of the Biennium" award from the National JACL. Due in large part to board members Harold Kameya and Phil Shigekuni, our chapter supports justice for the Asian women sexually exploited by Japan's Imperial Military during WWII. As an organization dedicated to social justice for all individuals aggrieved by state oppression, we stand with the so called "comfort women." To this end we have worked closely with the Korean American Federation of California to support efforts to bring this sad history to light. 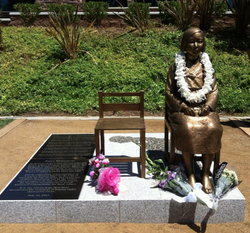 Our board members have spoken out in support of the Glendale Comfort Women memorial at different public events and have been interviewed by local and international media. 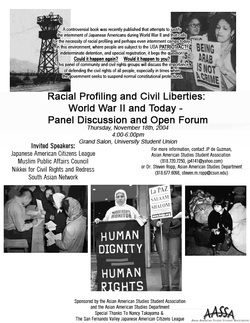 Along with our friends in Nikkei for Civil Rights for Redress (NCRR), we attempt to provide a progressive Japanese American voice on this controversial issue that resists Japanese nationalism. To learn more about our involvement with the comfort women issue, click here and here. Direct all media inquiries to the website editor. Our official resolution is support of the Glendale statue is available here. The San Fernando Valley JACL has been working with different community groups such as the National Hispanic Media Coalition to fight hate speech on the airwaves. We have been specifically concerned with the inflammatory rhetoric on the "John and Ken Show" on KFI 640AM which has long targeted immigrants and other People of Color, including Asian Americans. In addition to stoking the flames of racial prejudice by intimating Koreans are innately "scammers," the hosts called upon listeners to intimidate and harass a local immigrant rights activist by releasing his personal contact information over the airwaves. You can learn more about this campaign here as well as coverage in the Pacific Citizen and Rafu Shimpo. Since the 1970s, the San Fernando Valley JACL has brought national dialogues about Japanese American politics to the San Fernando Valley. Our board members were instrumental in two different, but intertwined movements emerging out of the need to break the silence of World War II. Board members helped establish EO 9066 an early non-profit organization dedicated to exploring the strategies for obtaining redress and reparations from the US government. Their activism, along with countless others, led to the passage of the 1988 Civil Liberties Act. 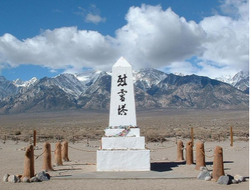 This same committed group of activists also helped organize the first pilgrimages to Manzanar. Our chapter still, intermittently, organizes SFV contingents to Manzanar. We are lucky that many of these individuals, such as Nancy Gohata and Phil Shigekuni remain active with our chapter and bring their legacy of activism to today's issues. In addition to our formal campaigns, we firmly believe that in today's polarized political landscape, a civil rights perspective is imperative for raising the level of common discourse. Our board members have contributed writings to local newspapers and other media outlets including the Pacific Citizen, Rafu Shimpo, Los Angeles Times and The Black Past. Recently, our members have spoken out or participated in actions ranging from historic and cultural preservation to CA Proposition 8 to gentrification in LA Chinatown to immigration reform to the Occupy Movement. (Note: individual opinions expressed by board members do not necessarily reflect the viewpoints or policies of the National or San Fernando Valley JACL).